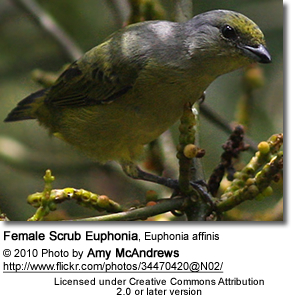 The Scrub Euphonias (Euphonia affinis) are found in Belize, Costa Rica, El Salvador, Guatemala, Honduras, Mexico, and Nicaragua. Its natural habitats are subtropical or tropical dry or moist lowland forests, as well as heavily degraded former forest. 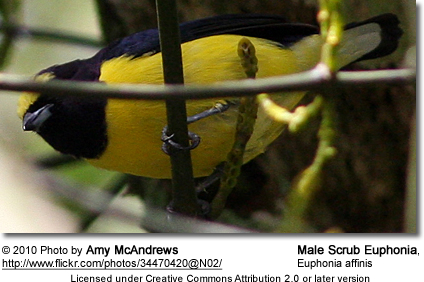 They resemble the Yellow-throated Euphonias, which can, however, be identified by their yellow throats (compared to the Scrub Euphonias' black throats).